If you want to make a special gift even more special, the origami gift bow is the perfect addition... and it's simple to make! For a printable pdf version of the gift bow instructions, click here. You will need Adobe Reader installed on your computer in order to open the .pdf file. You can get Adobe Reader here. 1. Start with a square piece of paper, white side up. Fold in half, then in half again. 2. 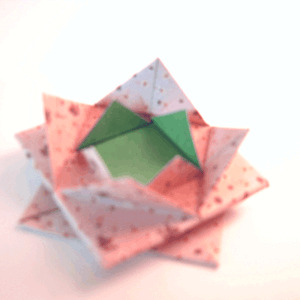 Fold all four corners into the centre and crease well. 3. Once again, fold the new corners into the centre and crease well. 5. 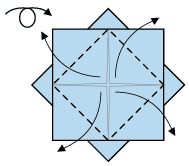 Fold all corners into the centre. 6. 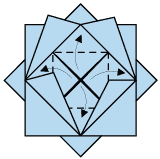 Fold each of the triangles outwards along the creases shown. 7. Turn the model over and fold out the centre triangles again. Let these triangles stand upright. 8. Fold the very centre traingles to stand up also.